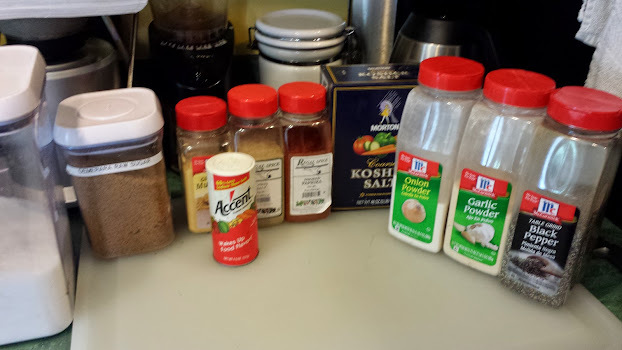 I got this recipe from my man Malcolm at HowToBBQRight. If you want to take your BBQ to the next level, he’s got all kinds of videos, tips, tricks, etc. Pretty down to Earth guy too. 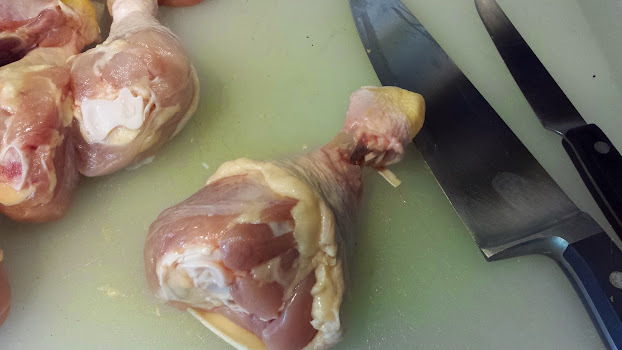 With a sharp knife, cut down to the bone just under the knuckle end of the drumstick. Be sure to cut through the tendons and connective tissue to the bone. Once you are done you are going to pull the skin and cartilage up and over the knuckle. I found it easier to use a paper towel to grasp the skin and pull it off. Once done, push the meat down as far as you can toward the other end of the bone. 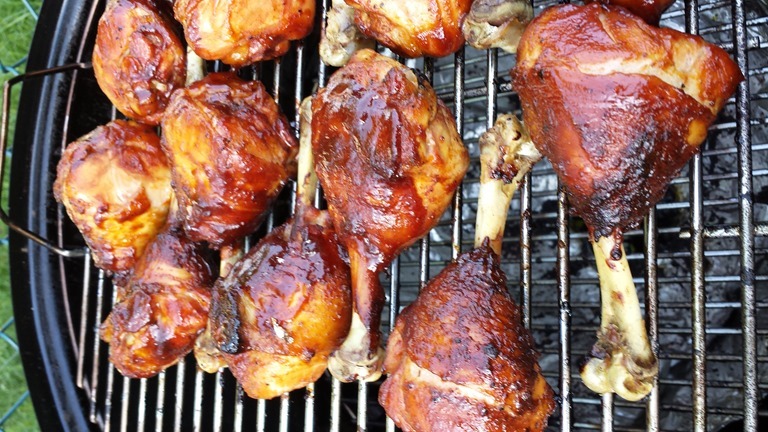 When the chicken cooks, the meat is going to shrink down the bone and gather at the meaty end. Here is where having dull kitchen shears made the job of snipping the tendon so frustrating. I ended up going with my large Chef’s knife to get the job done. Here is a shot of all the legs with the skin and cartilage pulled off ready for wrapping. 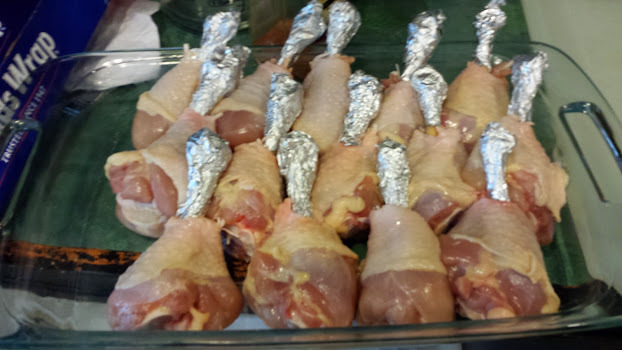 One of Malcolm’s tips is to wrap the bone ends in aluminum foil. This keeps the bones from turning black from the smoke and heat. This is for cosmetic purposes only. I’m sure they would taste fine without it. I just took a small piece of aluminum foil and wrapped the ends prior to applying the rub. Here’s a shot of them going only the smoker. 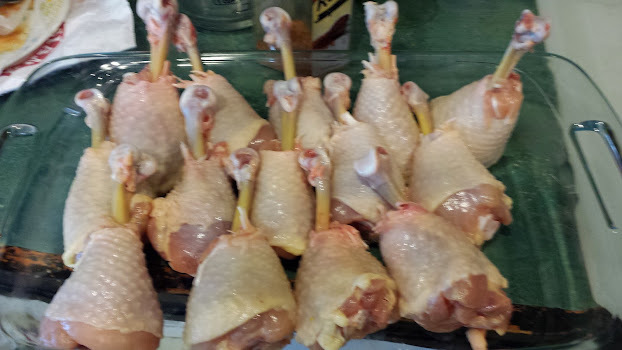 I didn’t have a drumstick holder and my pan was a bit too large to get them to stand vertical without some help. 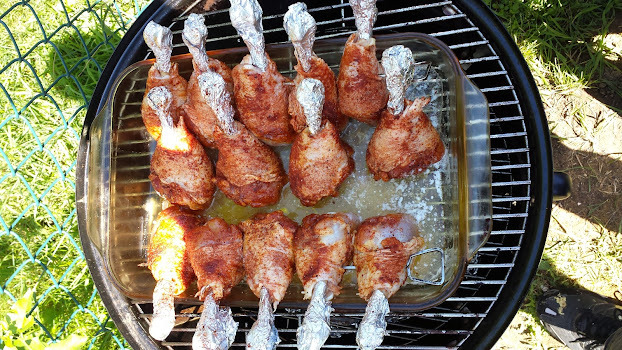 So I used some skewers and threaded it through the drumsticks. 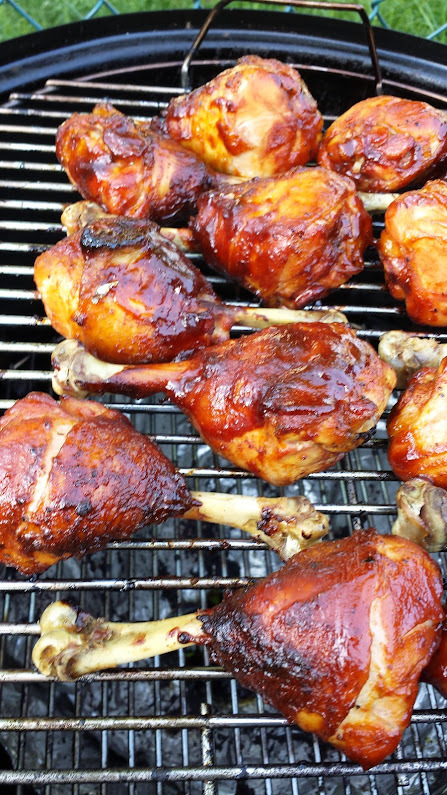 I melted a stick of butter in the bottom of the pan to give the drumsticks additional flavor during the smoke. One of the reasons I love my Weber is that it will hold steady without any help. IF YOU KEEP AN EYE ON IT! I used one Weber Chimney of lit Kingsford coals, and another half of unlit on top. Since I was shooting for a cook in the 2.5 hour range I wanted to make sure I had enough heat. I lined the water pan but did not fill it. Although you can’t see it in the above picture, I have a rack of bratwurst on for my boys as well. I added 1 block of Cherry wood per hour to the cooker to keep a steady smoke but not too overpowering. 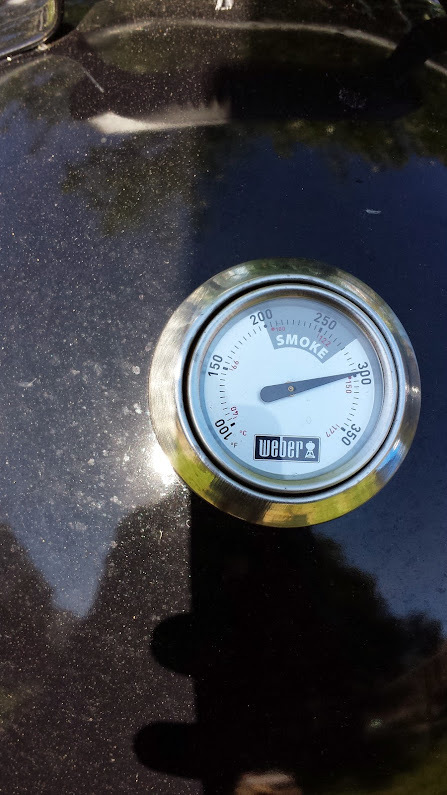 Once the smoker approached 275, I closed two bottom vents and left one open 100%. As always I left the top vent open 100%. I checked the temp every 30 minutes. First hour I was fine, Second hour temps begin to drop too fast and I had to open all the bottom vents to 100% to recover. Ten minutes later the temp was back where it needed to be. I’ve since ordered the Maverick 732 Remote BBQ thermometers to help me keep a better eye on temps when I’m inside the house. At 2 hours the legs were ready for the sauce. I brushed them with a 50/50 mixture of Sweet Baby Ray’s and Honey. After giving them a good coat, I put them back on for 30 minutes to tighten up the glaze a bit and let it caramelize. This is a shot after 30 minutes of glazing. Overall a good cook, and the family enjoyed them. So if my boys will eat it, it has to be good!